Shortstuff seeds is at the forefront in the area of Autoflowering cannabis genetics and are one of our favourite seedbanks. 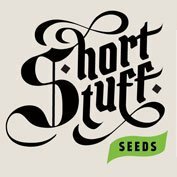 You can buy shortstuff seeds here and we often have special promotions running where we give away free shortstuff autoflowering seeds. Shortsuff Seeds are a group of auto flowering seed breeders working in Spain with the aim of producing the best autoflowering cannabis strains in the world. Shortstuff seeds have all been working with cannabis genetics since the 1990’s and switched their focus to autos in the mid 2000’s when the joint doctor created the original Lowryder strain. Since then they have created some of the best loved and best performing auto-flower strains in the world such as Himalaya Blue diesel, tha shiznit, Super Cali Haze and Auto purple amnesia.